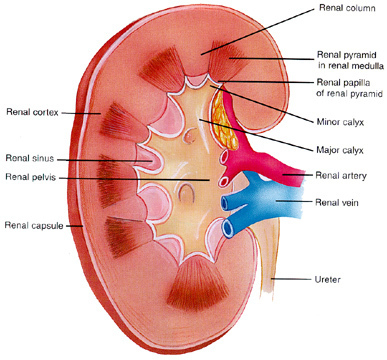 Renal pelvis is the proximal part of the ureter in the kidney. Kidneys are the most important organ of our body, which removes the wastes from our body, the waste material become urine and it is drain into the renal pelvis, it collects the urine until and unless it is passed on to the urinary bladder. It looks like a funnel; it stores urine from the thousands of nephrons present in kidney. This is a muscular cavity situated in the centre of kidney, sometimes it becomes enlarges; in this state it is called an extra – renal pelvis. Receives water waste products and wastes from the kidney – Kidney purifies blood and removes water and other waste material, the whole waste and water collects in it. Collect urine – Firstly, the urine is collected in the renal pelvis and then it moves down through the series of tubules. It collects the waste water, proteins and, minerals that are not absorbed by the body. Moves urine to the ureters – Renal pelvis collects the urine, which is located in the center of the kidney and then it moves to the ureter. Hence, the above are the main functions of renal pelvis, which is very important for our kidney because after the removal of waste it holds it until it moves to the ureter. Nowadays people are suffering from many renal pelvis diseases like – renal cell carcinoma, transitional cell carcinoma, papillary transitional cell carcinoma etc. The person who suffer from this disease tolerate pain and many problems, one must contact the doctor immediately so that his/ her treatment will start. Doctor must suggest these tests for the proper diagnosis like – abdominal CT scan, Renal Arteriography, intravenous pyelogram, blood chemistry, urine tests, bone scan, PET Scan, Abdominal MRI. After having these tests doctor can suggest medicine and begin the proper treatment. During the treatment, one might suffer from these complications – high blood pressure, liver problem, spread of the cancer, high red blood cell, too much presence of calcium in blood. After keeping, these points in mind doctor provide better treatment to its patient. Doctor provides medications and therapies to the patient so that it will be cured, if the disease has reached its last stage then it will create a big problem for the patient, in this situation patient may die. There are many therapies, which also helps during the treatment like- chemotherapy. Surgery is the last stage for removing this disease in which all the part of kidney is removed.